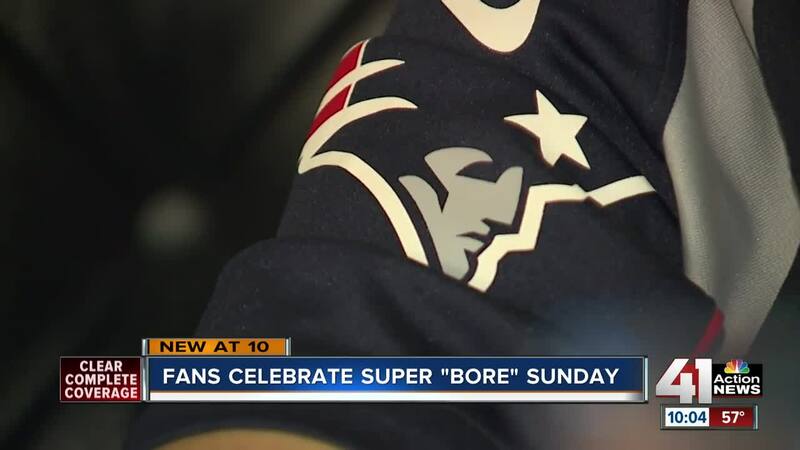 No Other Pub hosted the &quot;Super Bore Sunday&quot; party for the game (Photo via Tyler Navas). KANSAS CITY, Mo. — Football fans across the country apparently weren't excited about the Super Bowl LIII matchup. A recent poll found almost half of U.S. citizens were ambivalent about the outcome of the big game, which pitted the New England Patriots against the Los Angeles Rams. According to the survey from Remington Research Group, 44 percent of people were rooting for neither the Patriots, who won 13-3 for the franchise's sixth title since 2001 , nor the Rams. Nearly half of Americans said they weren't interested in the outcome of the big game (via Remington Research Group). In Kansas City, fans were still rooting for the home team. "I guess I'm still supporting the Chiefs, and I'm pretending the Patriots are the Chiefs," said Justin Weigel, who wore red Sunday to No Other Pub in the Power & Light District. He was one of the patrons present for the bar's "Super Bore Sunday" party. "There's nothing you can be happy about today, but at least they've got a name for it," said Andrew Wolford, who also was decked out in Chiefs gear. The same sentiment was prevalent on social media, including responses to a question on the 41 Action News Facebook page: if you're not watching the game, what are you doing instead? "Planning next year's Chiefs Super Bowl watch party," Timmy Johnson replied. "Playing Madden, where the Chiefs ARE in the SB," Alex Cate posted. "I just finished paying bills. It's more interesting than watching the Patriots in anything," Margie Finley said. Back at No Other Pub, Patriots fans praised Kansas City's hospitality. "It's the Midwest, so people are still being nice to us," said Rori Coakley, who's from Massachusetts. "If giving them side eye is nice, then yeah," Chiefs fan Edenia Herrera added. Whatever your definition of Kansas City nice, one thing is clear: Chiefs fans are pumped for the 2019 season. "It's our hometown, it's our home team," Emmanuel Herrera said. "You've got to love them."